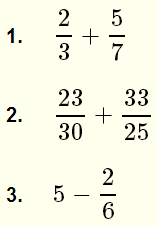 Several examples with detailed solutions and exercises with answers on addition of fractions, are presented. is used here to denote the fraction of a over b. a is called the numerator and b is called the denominator and must be non zero. NOTE: is undefined since division by zero is undefined in mathematics. A calculator to add fractions is included in this website. You may use it to check your answers. Example 1: Add and simplfy. Example 2: Add, simplify and express the final answer as a fraction. Example 3: Add, simplify and express the final answer as a fraction. 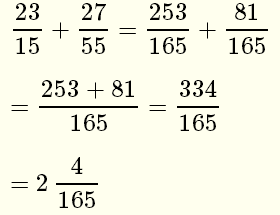 We first need to find the lowest common multiple (LCM) of the denominators 9 and 6 by factoring into prime factors. Example 4: Add, simplify and express the final answer as a fraction and as a mixed number. Example 5: Add, simplify and express the final answer as a fraction. 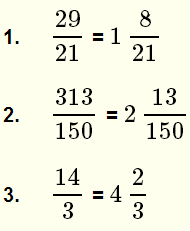 Exercises: Add, simplify and express the answer as a fraction and as a mixed number.